Arizona's Politics: Tucson Polar Bear Arrested In NYC, Now Endangered There; Was He Tagged? Tucson Polar Bear Arrested In NYC, Now Endangered There; Was He Tagged? 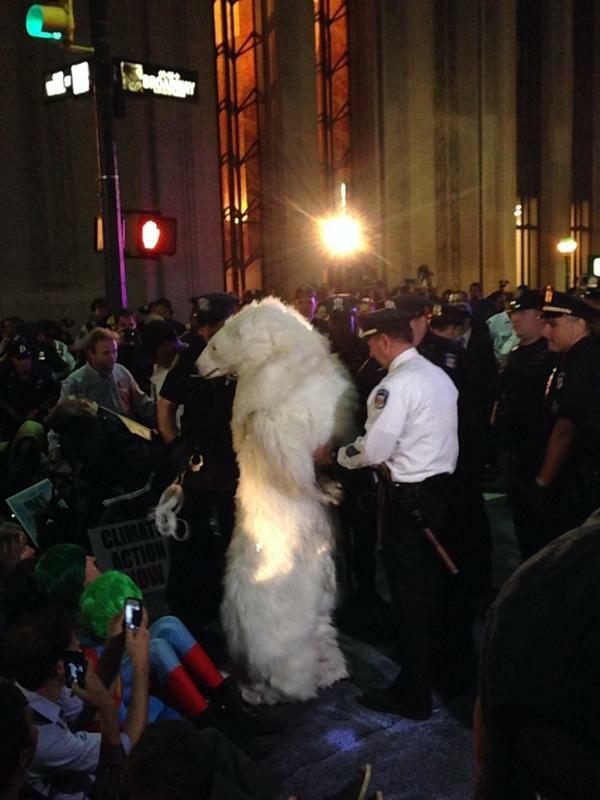 Tucson's very own polar bear became a hit on Wall Street ONCE he was arrested. Now, he is endangered there (too). Former Tucsonan Peter Galvin, one of the founders of the Tucson-based Center for Biological Diversity, donned a polar bear suit for the climate change protests in New York. The sight of a smallish polar bear being arrested became a social media sensation and was written up today in the Washington Post. The CBD was happy to Tweet and hour ago that Peter "FrostPaw" Galvin and Exec. Dir./Cofounder Kieran Suckling were released back (into the wilds of NYC). No word yet if they were tagged.